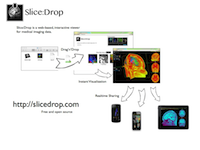 Traditionally, medical image data is visualized and processed on highly specialized software and workstations. Although such software is quite feature-rich, it is often OS-specific and overly complex, requiring a steep learning curve and large time investment. Significantly, there is no concept of real-time image sharing or collaboration in this field. Clinical or research findings from visualizations are described completely out-of-band, and collaborators need to indepedently render and interact with the image data to discover similar findings. This Real-Time Live! demonstration shows real-time sharing and interaction with medical data in a single shared session among linked laptops, workstations, smartphones, and tablets. This conceptually simple technology can enable new classes of medical imaging, reduce the obstacles to sharing data, and result in simpler, easier collaboration on clinical and research findings.